Tjebbe Beekman’s large, tactile paintings, currently showing at Galerie Diana Stigter, exhibit an ambivalent passion for their medium. Shiny, thickly layered paint is contaminated with sand, pieces of yarn, and nails. It is one of the most striking features of his work. In a series of smaller, snapshot sized pieces, acrylic and resin is applied so thickly that it has warped the paper underneath, leaving rectangles resembling melting polaroids or glass. Like most conceptual painters, Beekman makes paintings that are (at least in part) about painting. Thankfully, there is more to them than that. 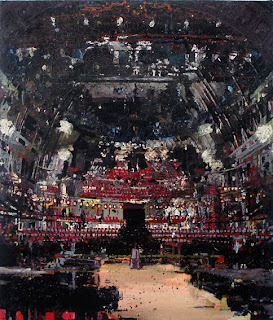 The paintings depict complex, yet ultimately false architectural environments created initially as digital composites. There is a giant theatre, a television studio, and multiple museum interiors. 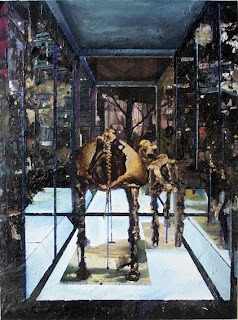 Whereas Beekman’s earlier paintings can be characterized by their middle-distance vantage points and empty spaces, the foregrounds of these new interiors are inhabited by non-human objects like TV cameras and skeletons in display cases. The artist’s previous paintings described a prophylactic existence - the “capsulization” of contemporary society and the experience of isolation within the spaces of modernity. Beekman’s latest environments are sites of presentation and mediation. Theses are the places where our society and our world, past and present, are re-presented back at us. Yet this is not intimate person-to-person communication, and the works still convey a sense of separation and emptiness. Indeed, we watch TV alone at home; we sit in a crowded theatre and do not interact with our neighbors; geography, time, and a physical pane of glass separate us from objects in museums. The architectural convolution and painterly distortion of Beekman’s spaces suggest that maybe what they present to us is not as clear as it might seem. These new investigations are not so much a deviation from Beekman’s previous body of work, as they are a conceptual evolution and refinement of ideas. 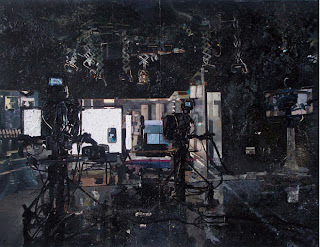 If The Image of a Capsular Society explored the symptoms of societal segregation and control, perhaps Beekman’s new paintings have begun to question the cause.